Angel Falls is a Class IV rapid on Big South Fork. Big South Fork National River and Recreation Area is either a welcome oasis of peace and quiet, or excitement in whitewater paddling or white-knuckled rock climbing – whatever your quest! Unexpectedly rugged yet within reach, the Big South Fork of the Cumberland River, preserved as wild and free flowing, alternately roars and calmly flows as it finds its way north from Tennessee into Kentucky. The river, its rugged gorge, and surrounding lands are refuges for an abundance of plants and animals including rare, threatened, and endangered species. The eroding sandstone of the Cumberland Plateau has created unique geologic features that beg to be explored like sheer sandstone cliffs, magnificent rock overhangs, waterfalls – including Kentucky's tallest, Yahoo Falls – and natural stone arches. Watch the river from high atop the cliffs at one of the many overlooks or walk along the river itself to see Class IV rapids such as Angel Falls and Devils Jump. Late summer and fall are great times to get out and enjoy the park's many outdoor activities, some of which may surprise you. Yes, great hiking, backpacking, and horseback riding are available, but the more extreme explorer in you won't want to miss white water paddling, mountain biking, rock climbing, fishing, and hunting. Trails ranging from footpaths to multiple-use routes that accommodate hikers, horses, wagons, mountain bikes, and vehicles will lead you to your own personal adventure. 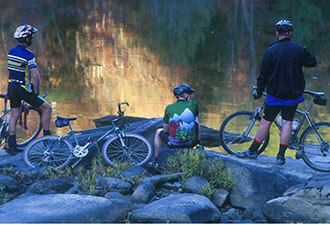 The backcountry trails, like nowhere else, will reveal to you the park's true beauty. Amid nature's wonders, the park's history is abundant with more known archeological sites than any other national park in the Southeast and evidence of Native American presence that can be traced back more than 10,000 years. Later settlers, in the late 18th and early 19th centuries, formed communities with interesting names like No Business. During the first half of the 20th century, coal mining, logging, and railroads rapidly changed the land and people of the region. You can explore this story at the Blue Heron Mining Community. Blue Heron is accessible by car or by the Big South Fork Scenic Railway, which departs from the former company town of Stearns, Kentucky. 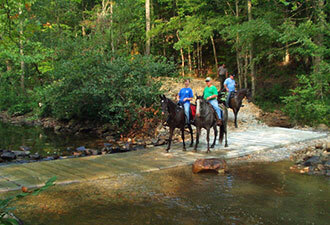 The park offers three special opportunities each year to experience the culture of the Cumberland Plateau. Spring Planting, held on the last Saturday in April, is a celebration of the farming heritage that enabled people to survive in the remote region. Plan to visit during the annual Haunting in the Hills Storytelling Festival on the third Saturday in September to learn about and help preserve the art of storytelling while you enjoy a day chockfull of fun with crafts, music, and demonstrations of traditional skills. And, on each Saturday in October, come on down to Blue Heron for Cultural Heritage Days to get a closer look at the area's history, folklore and traditional music, and arts and crafts. 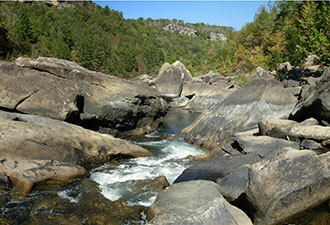 Big South Fork boasts some of the finest camping facilities of any national park. The Bandy Creek Campground sites have water and electricity, heated bathhouses with hot showers, horse stabling at nearby Bandy Creek Stables, and a swimming pool. The Blue Heron Campground features water, electricity, and a modern bathhouse with hot showers. For the horse owner, Station Camp and Bear Creek Horse Camps provide the amenities of modern camping along with the ability to keep horses at your campsite. Or leave civilization behind and get a permit for backcountry camping – a wonderful way for the hiker, paddler, or horseback rider to fully enjoy the rugged beauty and peaceful solitude of the Big South Fork. Want a backcountry experience without “roughing it?” Try the Charit Creek Lodge. To plan your perfect visit to Big South Fork National River and Recreation Area, check out the website, stop by, or call one of the two visitor centers, where National Park Service rangers are waiting to welcome you and help you get the most out of your unique park experience.